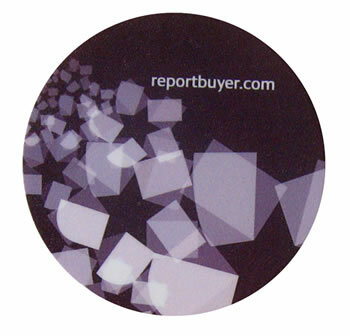 Round Drinks coaster made from recycled materials. Can be personalised with your promotional message on both sides. Manufactured from 90% Recycled materials, papers and plastics. Can be personalised with up to Full colour process TO BOTH SIDES. Thinner than a 1p piece and weighs almost nothing IDEAL for postal mailing campaigns. Patented Non Slip base, works with roller ball and optic mice alike. Price includes printing in Full Colour. Set-up £35.